Limone is situated in our Pagliarulo complex with infintity pool which includes also the following units, all published on this website: Albicocca, Uva and Nido. A wonderful and completely fitted-out self-catering property, Limone is comprised of two bedrooms (one bedroom can be only double while the other can be made double or twins), two bathrooms, a large living room with stunning sea view and a double sofa-bed, a newly renovated fully equipped kitchen with all modern appliances and a large private furnished outdoor area with a wonderful ocean view and BBQ, perfect for sunbathing and al fresco dining. Among the many amenities: air conditioning and heating, high speed internet access, a washing machine and a dishwasher. Limone's guests can enjoy the shared infinity pool and large sundeck of the complex. There are plenty of sun loungers with pool towels available for each guest. The pool is open from the end of March to the beginning of November weather permitting and it's heated during the medium/low season. The two bedrooms are elegantly decorated and one is with en suite bathroom. Both the en suite and second bathroom (which has a jetted shower) are tiled with hand painted Vietri majolica. Parking space available in the garage of the complex for Euro 20 per day per car. Limone is located in one of the most scenic and picturesque areas of the Amalfi Coast: Marmorata, the area of Ravello closest to sea. The location is strategic: infact, even if it's in the area of Ravello, Amalfi town is at only 1.5 miles/2.4 km far (about 7-8 minutes by car, taxi or bus); the bus stop is a few meters from Limone and by bus it's possible to reach easily all the towns along the Amalfi Coast for those guests who wish not to use a car or a cab. But Ferry lines for Capri, Amalfi, Positano etc, also depart from the charming village of Minori, which is just a short walk from the villa (10 minutes) or 2 minutes by bus, car or taxi. Minori features sand beaches, shops, grocery stores, banks, excellent restaurants and one of the best and world's most famous pastry shops "Sal De Riso". Our Pagliarulo complex is a perfect base to visit all the towns along the Amalfi Coast, and also other towns such as Sorrento, Pompeii and Hercolaneum. For the definitive confirmation of the reservation, a deposit of 50% of the total amount of the stay (+ service fee) is required at the moment of the booking, through HOMEAWAY/VRBO reservation system. The balance will be paid on arrival. 100% Refund of the deposit (+ service fee) if the cancellation is made not later than 60 days before the beginning of the rental period. - Rental period can start any day of the week. For arrivals from 8.30 pm to 11.00 pm an additional fee of €30 will be charged. For arrivals AFTER 11.00 pm the fee increases to €50. This is the second time we have stayed at villa Limone and we are already planning to return soon. The villa is wonderful, very spacious, and very nicely decorated. Almost every night we have our dinner on the private terrace which is amazing with stunning views. 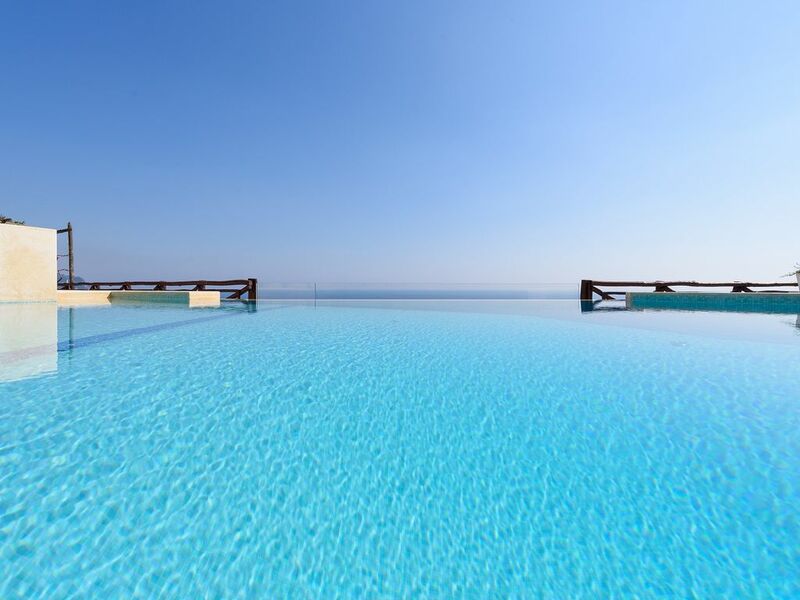 The infinity pool is as beautiful as it looks in the photos, A really short walk to Minori and you have also beach, excellent restaurants and grocery shops. Big thanks to Vincenzo, Franco and Norma who are always friendly and very helpful. Just returned from a week at Limone with Amalfivacation. The Villa is just amazing - spacious with breathtaking sea views. Kitchen is well equipped and we loved to enjoy long dinners on the large terrace. Pool area is absolutely stunning! And there’s free internet! Vincenzo was so helpful during our booking and the run up to our holiday. And Norma and Franco, who look after you on-site are just delightful. I really would recommend this villa and the whole Pagliarulo complex most strongly! My two sons and my parents and I had the most wonderful stay at Limone . It is a beautiful, sun-filled apartment with a lovely terrace and a view over the sea that you will dream about long after you have left Italy. Everyone who helped us organize our stay (Vincenzo) and answer our questions while we were there (Franco) were so helpful! They really care that you have the best stay possible. They gave us suggestions for restaurants and organized taxis for us. They make you feel like you are staying with friends. Trust me, this is a big part of the experience when you are renting an apartment in another country rather than staying in a hotel. The pool area is beautiful, the views are spectacular. We loved the fact that you could walk to the cute village of Minori to grab food and supplies or take the ferry to other nearby towns. We also enjoyed a walk home from Ravello down a series of many steps. It's a wonderful location run by very nice people. I highly recommend it! Thank you, Vincenzo and Franco! Lovely and clean house! 2 bedrooms, 1 sofa bed in spacious living room, kitchen, 2 bathrooms, balcony overlooking the sea, very own private patio/bbq area, amazing swimming pool overlooking the sea. Franco waited outside the property for us to open the garage. He also showed us around the whole property and even gave us pool towels. The view was spectacular! Location wise, it is just around 10mins walk from Minori town (with Italy's top bakery - you must try the pistachio cake! ), you can take boats to other nearby towns as well. I was also informed a few days before our stay by Vincenzo that there would be a firework display during our stay. It was by far the best firework experience I have ever had! All in all, we would definitely come stay here again in the future! Limone is located in one of the most scenic and picturesque areas of the Amalfi Coast: Marmorata, the area of Ravello closest to sea, near to the charming village of Minori. The location is strategic: infact, even if it's in the areas of Ravello, Amalfi town is at only 1.5 miles/2.4 km far (about 7-8 minutes by car or bus; the bus stop is at few meters from the complex): Amalfi is the most important town along the coast also in terms of public transportation system. Ferry lines for Capri, Amalfi, and Positano also depart from the charming village of Minori, which is just a short walk from the villa (10 minutes) or 2 minutes by bus, car or taxi. Minori features sand beaches, shops, grocery stores, excellent restaurants and one of the best and world's most famous pastry shops "Sal De Riso". Thanks to it's location Limone and Pagliarulo complex is a perfect base for anyone visiting any of the towns along the coast and also other towns such as Pompeii and Hercolaneum. BBOOKING INFORMATION: -Confirmation Policy : For the definitive confirmation of the reservation, a deposit of 50% of the total amount of the stay (+ service fee) is required at the moment of the booking, through HOMEAWAY/VRBO reservation system. The balance will be paid on arrival. -Cancellation Policy: 100% Refund of the deposit (+ service fee) if the cancellation is made not later than 60 days before the beginning of the rental period. - Minimum Stay: Only 3 nights. - Rental period can start any day of the week. Check-in: any day of the week from 2.30 PM to 8.30 PM. A different time can be agreed, according to the availability. For arrivals from 8.30 pm to 11.00 pm an additional fee of €30 will be charged. For arrivals AFTER 11.00 pm the fee increases to €50. Check-out is by 10.00 AM. A different time can be agreed, according to the availability.